Shrubs 10–70 cm. Stems ascending. Leaf blades linear to narrowly oblong, (2–)3–5 cm × 2–8 mm, abaxial surface white-hairy to white-velutinous, not glaucous, adaxial often white-hairy on base, petiole, and midvein, ± glaucous when young. Pedicels recurved, pale-glaucous, seldom more than 6(–8) mm, rarely 2 times length of corolla. Corymbs nodding, (2–)4–8-flowered, on curved branchlets. Corollas 6(–8) × 5–6(–7) mm, not dilated basally. Capsules obovoid to subglobose, 4–5.5 × 4 mm, glabrous or minutely hairy at base. 2n = 48. Phenology: Flowering May–Jul(-Sep); fruiting Jun–Sep. Greenland, St. Pierre and Miquelon, Man., N.B., Nfld. and Labr., N.S., Ont., P.E.I., Que., Sask., Conn., Ill., Ind., Maine, Mass., Mich., Minn., N.H., N.J., N.Y., Pa., R.I., Vt., W.Va., Wis., Europe, Asia. Variety latifolia occurs farther south and east than does var. polifolia, from southern Saskatchewan and southern Manitoba to West Virginia, Newfoundland, and southern Greenland; it is sympatric with var. polifolia in the boreal extent of its range in southern Labrador, Nunavut, northern Ontario, and Quebec. Variety latifolia is globally secure but is of conservation concern in some states: Connecticut (threatened), Indiana (rare), New Jersey (endangered), Ohio (presumed extirpated), Pennsylvania (rare), and Rhode Island (endangered). In eastern Canada and northeastern United States this variety is highly regarded as an ornamental with named cultivars. The pink flowers in terminal umbels make this acidophilous peat-bog shrub very attractive, and it is cultivated successfully in some gardens where the acid soil condition can be duplicated. Some of these cultivated forms have been given varietal names, although it is unclear whether they deserve taxonomic recognition. Variety iodandra was described as having the corolla broader than long rather than urceolate, and the anthers purple or purplish brown rather than pale brown; it is known only from the type locality, Table Mountain, western Newfoundland. 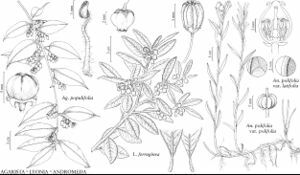 Facts about "Andromeda polifolia var. latifolia"